Specialists from the biological faculty of Moscow State University have studied the way the photoactive orange carotenoid protein (OCP) exchanges carotenoid with proteins of similar structure. The discovery will boost the development of OCP-based antioxidant drugs aimed at protecting healthy cells during cancer treatment. The paper was published in the Biophysical Journal. The orange carotenoid protein (OCP) is a small water-soluble protein that serves as an excitation energy quencher in cyanobacteria: it reduces energy transfer in the photosynthetic apparatus under high light conditions. Cyanobacteria are one of the earliest organisms on the Earth capable of photosynthesis. Our planet owes them high concentration of oxygen in the atmosphere. Under strong light orange carotenoid protein changes its structure and interacts with antennas to prevent formation of reactive oxygen species. Carotenoids are long hydrocarbon molecules with a large number of double bonds, which serve as photosensitive chromophores. The color of carotenoid depends on the protein state. Previously, the biologists from the Moscow State University have described the structure and properties of the OCP domains which appeared to be capable of binding the carotenoid into a complex of bright violet color. One of the interesting and previously unknown properties of the orange carotenoid protein is the ability to transmit the carotenoid to other proteins with a similar structure. The mechanism of the process is described in the mentioned work published in the Biophysical Journal. "We studied the interaction of carotenoid-containing violet C-domains of the OCP with a colorless apo form of the OCP. As a result of the interaction, the colorless apo form of the OCP became orange and photoactive (capable of changing its structure and color). 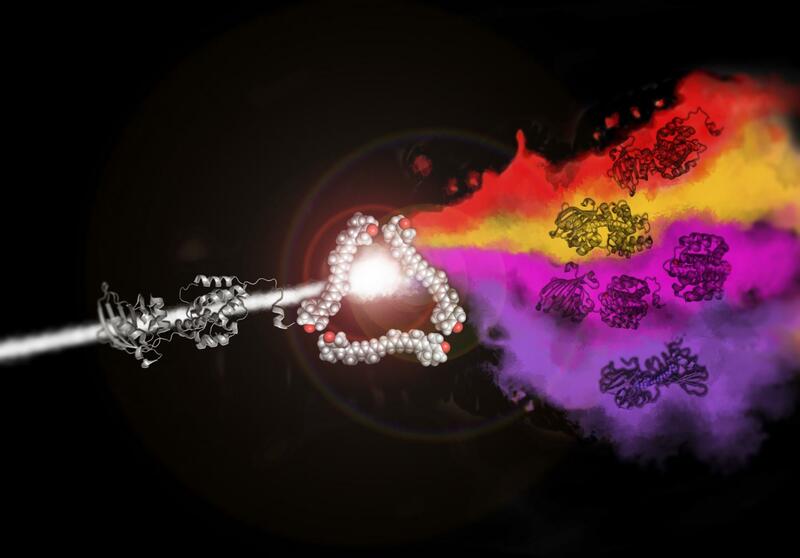 The carotenoid transfer process simulates the process of assembling a photoactive protein from a protein matrix and a chromophore (carotenoid)," said Dr. Eugene Maksimov, senior researcher at the Laboratory of Biophotonics. The discovered transfer reaction of a hydrophobic carotenoid molecule between two water-soluble proteins gives us several interesting opportunities. This mechanism will allow us create water-soluble protein complexes to deliver antioxidant carotenoid to cells that need protection from the reactive oxygen species: for example, to the healthy tissue during photodynamic cancer therapy. The photoactive properties of the complex will be useful in molecular thermometers: their color will show the difference in temperature between the parts of the cell.